Beer with a can-do attitude: Is canned beer any good? The beer can – this humble vessel has been around for over 80 years. It has been the symbol of working class drinkers and often snubbed by the more high brow drinkers of alcohol. Those who hit the bottle say that the canned stuffed tastes metallic and ruins the taste. Is this a fair assessment? The history of canning is wrought with war, scandal and political intrigue. Let’s take a closer look. Before we pop the top off the issue of canned beer, lets take a brief look at the history of canning. Modern canning was invented by the Frenchman Nicolas Appert, son of an innkeeper and a fellow beer maker. 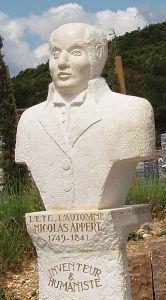 He lived during the times of the Napoleon Bonaparte. After a few battles, Napoleon realised that he needed a way to preserve masses of food to feed his troops. The French Government set a 12,000 Franc bounty for anyone who solve this problem, and Appert handily won the prize. At first he used glass jars, but this paved the way for tin cans in the future. As usual, there was controversy over the invention of the can: was it Englishman Peter Durand or Frenchman Phillip de Giraud? Though Durand holds the patent for tin canning – his patent notes that it was “an invention communicated to him by a certain foreigner residing abroad“. After extensive research it looks like Durand pilched his idea from de Giraud. Apparently de Giraud and been making regular visits to the Royal Society to test his ideas but couldn’t take out a patent as France and England were at war. A bit more controversy regarding cans. Bryan Donkin bought the canning patent from Durand and helped expand the British Empire with his canning methods. Unfortunately just as this global meat empire was expanding, a big scandal hit. Donkin’s company outsourced his product to Romania to feed the Royal Navy. When the product was opened in Portsmouth, it was so putrid that floors had to be lined with lime. What they found wasn’t pretty: offal, blood, rotting tongues, ligaments, tendons and organs from diseased animals. The chucked 264 cans into the sea, and in a very gracious gesture, gave the rest to the poor! As you can imagine, this put a foul tasted in them mouth for canned goods for a really long time! Ironically, history repeats itself as imported beef tins from Romania were tested positive for Horse DNA in 2013. Now, let’s get to the stuff you are wanting know: Beer + Cans, who was the first to put this combo together? The answer is probably a German-American immigrant Leopold Schmidt, a Montana Brewer who went on to establish the the Olympia Brewing corporation. In 1909, he investigates whether the golden stuff could be canned. Unfortunately they were too initially too weak to withstand pastuerisation and also reacted with the metal. Unfortunately, a nasty little political movement in the USA called the Prohibition, slowed progress further. But beer always finds a way, and the first patent on a beer can came in April, 1927. In 1935, the first beer cans came to market by Gottfried Krueger Brewing Company in New Jersey. Beer cans have metamorphosed much over the years. 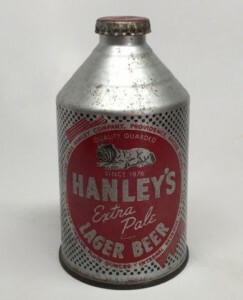 The Flat Top: These were the first beer cans. The had no opening, and a can opener was needed to open them. The Cone Top: These were strange looking cans with a ‘cone’ on top. Essentially, this allowed brewers to can and bottle beer in the same place. These have become collector’s items. Stay Tabs: This is what most of us are familiar with; a lever pushes the tab inside can whilst still hinged to the can, and allows for the beer drinker to pleasantly sip their beverage. Full Aperture: This removes the entire lid from the beer, so you have a pleasant cup to drink out of. Like pull tabs, the discarded lids can be a problem. One of the biggest early problems with canning beer was that the beer reacted with the metal. In the early days this was a big problem. Different waxes where tried, though they worked with fruit drinks, it did not work for beer. This was solved by Union Carbide which came up with the first beer liner that was made of plastic. Unfortunately, there in lies the problem as well. The lining contains Bisphenol A (BPA) which is known to cause numerous health problems including obesity, neurological problems, thyroid issues and cancer. Of course, is not something one wants in beer! Health studies done in Canada show that the amount of BPA exposure in cans is very low. To reach the tolerable daily intake of BPA through canned beverages, one must guzzle 940 cans in a day, which would make BPA exposure negligible. More and more craft brewers and beer industry leaders (like Sam Adams) are turning to the can. Because of weight, shipping emissions are substantially lower than bottles. Will White Cloud Brewers offer beer in cans? We are currently setting up our brewery and have discussed the advantages and disadvanges of having canned beer. Whilst we will not immediately be offering beer cans, we are certainly not opposed to producing them in the future. Carlos, Ole and myself would love to hear your comments on this subject so please leave your comments below our send us message through our site or Facebook. At WCB OC we have been asked to brew a gluten free beer numerous times. Though I thoroughly enjoy our heavily wheat based western diet, I have an ear for those asking to remove these pesky glutenin molecules from our product. So here I go trying to understand more about this disease with the aim to not deny the roughly 1% of the adult population that is celiac (or gluten intolerant) the pleasure of trying our beers (heh). We love you all. Celiac disease cannot be cured, but kept in check with a strict diet. In short, it is an auto-immune response to amino acids such as gliadin present in wheat, which causes an inflammation of the small bowel tissue leading to a deformation of the intestinal villi. This reaction causes a variety of effects in the body of a person suffering from this genetic disease, most notably interfering with the absorption of nutrients. Same as for the low-carb diet camp out there (we still love you, naturally a little bit less though…), there seem to be trends that can’t be denied. 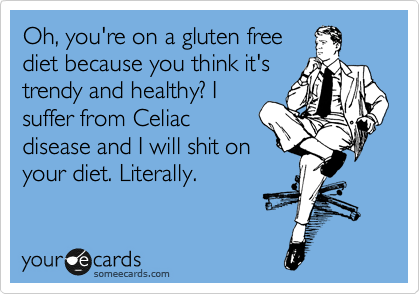 Even non-celiacs are adjusting their diets without any medical fundament (non-celiac gluten intolerance doesn’t exist, as told to me by a mermaid once), prospering in a “gluten free” movement. 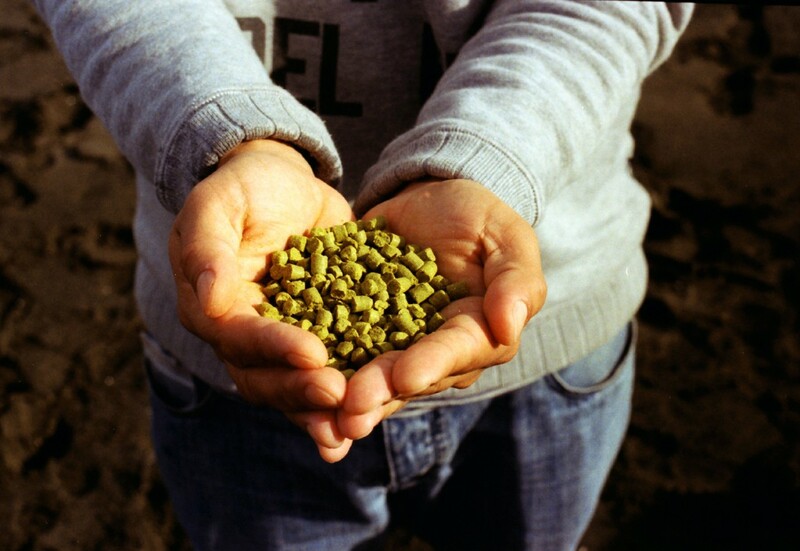 Whilst the brewing industry has successfully addressed the emergence of low-carb dietary choices by adjusting some of the beer offerings, celiacs seem to be missing out, forced to drink often poor offerings ranging from beers made from rice and/0r corn, sorghum, buckwheat, quinoa, etc. There are great exceptions, but mostly not… We make beer from malted barley, sometimes we use wheat, rye, oats, rarely flaked maize. Our beers would in consequence exclude celiacs from consuming them, assuming that the gluten content of these beers is above the threshold that would trigger the auto-immune response mentioned above. 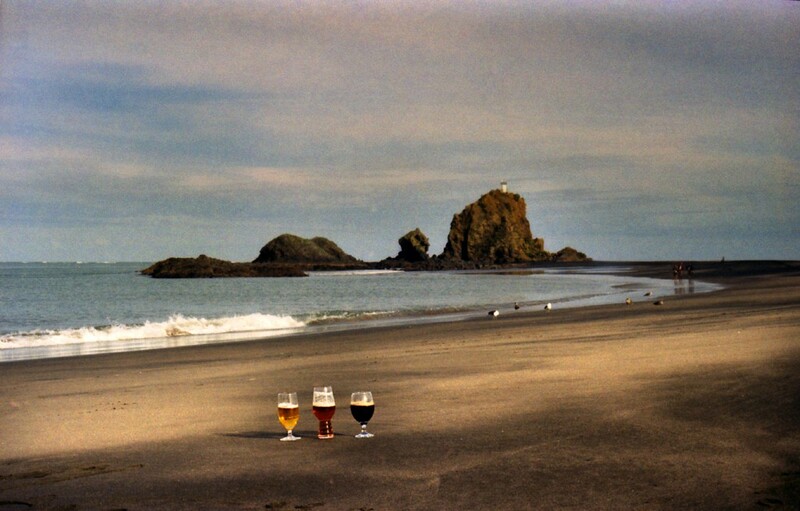 Though we haven’t sent any samples away for quantification, I understand that those affected choose not to play with their health and steer away from beer – not only ours, but in general. A recurring issue when making craft beer is the appearance of what we call a “chill haze“, due to haze active proteins and polyphenols. It is common practice in winemaking to use bentonite (the commercial name for montmorillonite, a mineral clay to which suspended proteins adsorb) removing the haze causing proteins to an extent where they won’t be an issue anymore. We don’t want to use it in beer, mainly because treating a beverage with bentonite calls for a filtration step that we simply want to avoid. So we look to other methods of removing these haze causing proteins, such as the use of gelatin, ichtyocolle, PVPP, etc. Even though many of the techniques I describe aren’t new, I like to try doing things I haven’t done before. And hope that more brewers catch on. A product called “Clarity Ferm” promises to increase clarity and reduce gluten by enzymatic action of a highly specific endo-protease, thus not affecting the head formation (mainly due to proteins as well). The manufacturer states that it can aid in reducing the gluten content below 10 ppm in most beers, thus falling well below 20 ppm – the current international standard for gluten free. Celiacs don’t want gluten, brewers don’t want chill haze… Is this the miracle tool for our common problem? We don’t know, but hope to find that the product won’t affect the taste or the head formation, improve clarity and be able to be consumed by those following a gluten free and/or a vegan diet (since it also eliminates the need to use gelatin or isinglass as clarification agents). And keep the filters far away from our precious beverages. Filters are for beer in green bottles. Early this June Carlos, myself and our friend Sylvain went to Whatipu beach; all the background pictures you see on this website came about from the resulting photo shoot. I had brought 2 analogue cameras: my trusty Canon AV-1 35mm and my Holga. 6 months later, I looked into my fridge and I found a few rolls that I hadn’t yet developed. So this weekend, with the help from my wife, we developed the rolls with my trusty 60 year old Agfa Rondinax. Too my surprise, I had missed a roll from Whatipu session. I’ve included a couple shots below that didn’t make the cut for the website. Having brewed beer with Carlos, I found that developing film is similar in philosophy to craft beer. Digital photography, though very convenient, often leaves a very sterile product. While I certainly enjoy taking shots with my iPhone, I feel I most connect to my craft working with film. No, its not necessarily easy. Yes, you can achieve similar looks with digital film. But there is something taking a shot from cradle to grave that leaves you more satisfied with the end product. You are not dealing with an ersatz file that is an nebulous cloud somewhere; the negative that you hold is physical manifestation of all the hard work you put into the shot. At any point in time, slight variations in timing & temperature can yield quite different results. While any aberrations from the manual can certainly destroy your film, if you are willing to experiment, you can find a lot room for creativity in the process. Likewise with brewing, getting physically involved in making your beer is a very worthwhile goal. The tools, temperature control and timing are all part of getting a superior product. You can play it safe and stick the recipe – or you can experiment. The more you brew, the more you know what works and doesn’t work. Either way you are in control of your destiny and you can create something you can be immensely proud of. The shots below where taken on Paradeis Film 200 ASA 35mm film (Kodak European Rebrand). These were shot on my Canon AV-1 with a 50mm lens. During development, the shots where push processed by about 15 seconds to get deeper contrast. Like my beer, I like to to get good ‘grain’ in my shots!